1. It is recommended that you choose a flower that is on season to save money and time. This will not give you hard time trying to order the flower as well. 2. You can choose other alternatives like silk flowers especially if the flower you would like to use is not in season. Silk flowers are also suited in formal weddings; fresh picked flowers may not fit a very formal party. 3. Your bouquet should not drown you. Be sure that it will not cover your figure. If you are petite, the weight of the flower might be too heavy for your built and may affect your posture and how you carry your gown. Remember that your bouquet should not be too big so as not to cover your elegant gown and should be easy to carry. 4. The flowers you chose should last for the entire day. Make sure that your flowers still hold up even at the end of the day so that you will still look glamorous when taken pictures. Using a bouquet holder is suggested to keep the flowers fresh during the entire day. Also take the advice of your florist on which flowers easily wilt so that you can avoid choosing them. 5. Don’t let your florist imagine the flower design you like. You may take a picture or a printed copy of the bouquet style you prefer. Also bring a sample fabric of the gowns so that the florist can choose the correct shade of flower that will match the color of the gowns. Some bouquets may be decorated with ribbons, lace and silk materials. You can advise the florist on what specific designs would you like to add for your flowers. 6. Why not choose a flower that has special meaning? That will not be difficult since most flowers have their meanings. Stephanotis stands for happiness in marriage, Rose means love and being true, and Tulips stand for perfect love and declaration of love. 7. One of the first things to consider when opting for a bouquet is the style. Choose the bouquet style that will suit you and your personality. 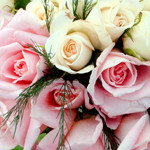 Bouquets are more personal nowadays and reflect the brides’ personalities. For Nosegays, where flowers are clustered in a round form, can vary in sophistication and will fit any personality. In Cascade bouquets, flowers are arranged in a descending form. These bouquets are voluptuous and can be the center of attention. They are recommended for traditional weddings. There are flowers where stems are wrapped around in ribbons and they are called Hand-tied bouquets. These bouquets bring a casual aura and are recommended for garden weddings. There are also Contemporary bouquets where flowers are arranged in style but with no geometric form. These arrangements of flowers represent the individuality of a bride and are mostly used in sophisticated weddings. 8. The top wedding flowers are Rose, Lilly, Orchid, Hyacinth, Tulip, Stephanotis and Daisy. You may want to follow the trend and choose these flowers for your bouquet.